What’s the point of living after your world has been destroyed? 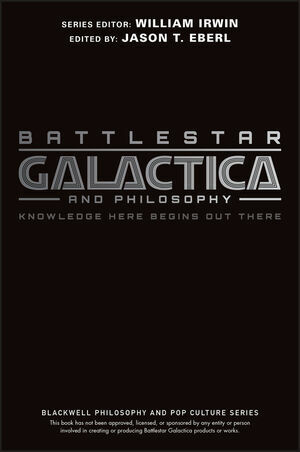 This is one of many questions raised by the Sci-Fi Channel’s critically acclaimed series Battlestar Galactica. More than just an action-packed “space opera,” each episode offers a dramatic character study of the human survivors and their Cylon pursuers as they confront existential, moral, metaphysical, theological, and political crises. This volume addresses some of the key questions to which the Colonials won’t find easy answers, even when they reach Earth: Are Cylons persons? Is Baltar’s scientific worldview superior to Six’s religious faith? Can Starbuck be free if she has a special destiny? Is it ethical to cut one’s losses and leave people behind? Is collaboration with the enemy ever the right move? Is humanity a “flawed creation”? Should we share the Cylon goal of “transhumanism”? Is it really a big deal that Starbuck’s a woman? Jason T. Eberl, Ph.D. is Assistant Professor of Philosophy at Indiana University-Purdue University Indianapolis. His research interests focus on bioethics, metaphysics, and medieval philosophy. He has co-edited, with Kevin S. Decker, Star Wars and Philosophy (2005) and Star Trek and Philosophy (forthcoming). Giving Thanks to the Lords of Kobol. “There Are Those Who Believe …”. Part I Opening the Ancient Scrolls: Classic Philosophers as Colonial Prophets. Erik D. Baldwin, How to be Happy After the End of the World. Robert Sharp, When Machines Get Souls: Nietzsche on the Cylon Uprising. J. Robert Loftis, “What a Strange Little Man”: Baltar the Tyrant?. Jason P. Blahuta, The Politics of Crisis: Machiavelli in the Colonial Fleet. Part II I, Cylon: Are Toasters People, Too?. Robert Arp and Tracie Mahaffey, “And They Have a Plan”: Cylons as Persons. Amy Kind, “I’m Sharon, but I’m a Different Sharon”: The Identity of Cylons. Jerold J. Abrams, Embracing the “Children of Humanity”: How to Prevent the Next Cylon War. Brian Willems, When the Non-Human Knows Its Own Death. Part III Worthy of Survival: Moral Issues for Colonials and Cylons. Randall M. Jensen, The Search for Starbuck: The Needs of the Many vs. the Few. Andrew Terjesen, Resistance vs. Collaboration on New Caprica: What Would You Do?. George A. Dunn, Being Boomer: Identity, Alienation, and Evil. David Roden, Cylons in the Original Position: Limits of Posthuman Justice. Part IV The Arrow, the Eye, and Earth: The Search for a (Divine?) Home. Jason T. Eberl and Jennifer A. Vines, “I Am an Instrument of God”: Religious Belief, Atheism, and Meaning. Taneli Kukkonen, God Against the Gods: Faith and the Exodus of the Twelve Colonies. David Kyle Johnson, “A Story That Is Told Again, and Again, and Again”: Recurrence, Providence, and Freedom. Eric J. Silverman, Adama’s True Lie: Earth and the Problem of Knowledge. Part V Sagittarons, Capricans, and Gemenese: Different Worlds, Different Perspectives. James McRae, Zen and the Art of Cylon Maintenance. Elizabeth F. Cooke, “Let It Be Earth”: The Pragmatic Virtue of Hope. Sarah Conly, Is Starbuck a Woman?. David Koepsell, Gaius Baltar and the Transhuman Temptation. There Are Only Twenty-Two Cylon Contributors.